"I got the idea for these shrimp tacos from a favorite restaurant. 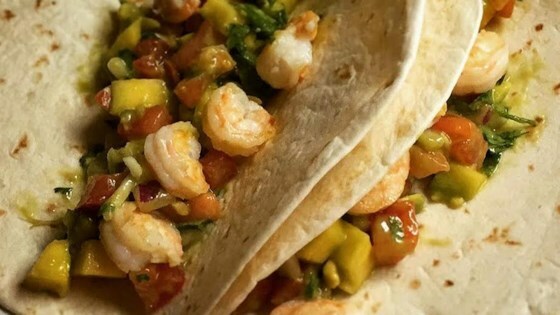 The shrimp is sauteed in honey butter, topped with a delicious mango salsa, and wrapped in a tortilla. It tastes worth a million bucks yet is so simple. Everyone will be begging for more." See how to make spicy turkey and yam filling for tacos. Forget the honey butter, sauté the shrimp in olive oil and mix with taco seasoning, go lighter on the cilantro as others suggested, and add one half chopped red pepper! Divine!! Excellent recipe! Thanks for sharing. I like the mango salsa so much I make it just to munch on with tortilla chips too.